Records and Reports in your Flipcause database contain lots of information. Since you won't always need all of this data, you can download a Custom Report that includes only relevant information. After generating your report, scroll and click the Custom Report button. This will open an overlay that displays all of the fields available within your report. 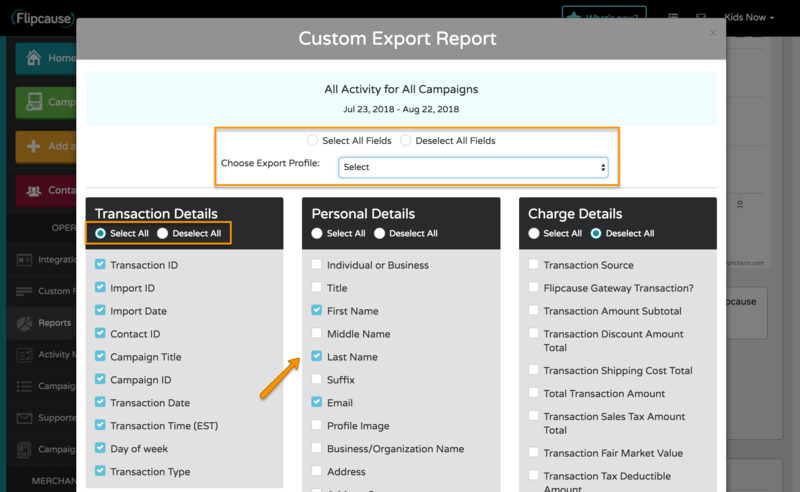 You can use the radio buttons to Select or Deselect All Fields (default), or Choose an Export Profile from the dropdown list. You can also individually select the fields you want to display by clicking the checkbox next to them. Note: If you plan to pull the same report more than once, you'll want to create an Export Profile. Once you've made your selection, scroll to the bottom of the window, choose how you want to view the report (open in a new window, email as .csv, or both), and click Get Report.